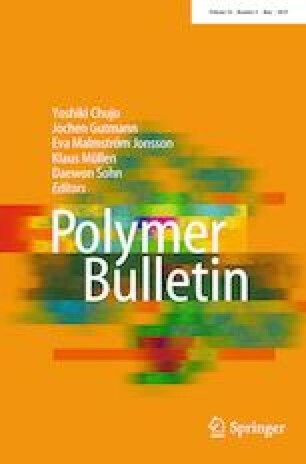 This article considers the modification of cellulose fibres with the use of vinyltrimethoxysilane and maleic anhydride as substances to improve the wettability of the additive in the hydrophobic polymer matrix. The stress is put on the possible ways of modification impact investigation and its description. Effects of the treatment are analysed using Fourier transform infrared spectroscopy, which reveal the presence of new moieties on the cellulose surface, e.g. C=C bonds, C=O and Si–C groups, while dynamic light scattering investigation revealed an increase in the hydrodynamic radii of the molecules which was maximized in the case of modification with the use of maleic anhydride. Furthermore, thermal properties were defined with differential scanning calorimetry and thermogravimetric analysis. Some variations within the process of samples thermal degradation are observed—thermal stability of the specimen modified with maleic anhydride is the highest. The presented approach of combined fibre modification analysis techniques, being a scientific novelty, allows to confirm the treatment impact on cellulose properties at many levels. Increasing interest in new materials from renewable resources and potentially environmental friendly methods for modifying such materials has led to increased interest in using cellulose . Due to its abundance in the environment and its quick renewability as a biodegradable raw material , cellulose and its modifications have become a subject of research for many scientists. Cellulose exists in the cell walls of plants and can be produced by bacteria. It is a polysaccharide that is formed by the repeated connection of d-glucose building blocks, and it is characterized by specific properties that differ from other natural and synthetic polymers. Cellulose is distinguished by its hydrophilicity, biodegradability and broad chemical modification capacity . The high hydrophilicity of the cellulose surface defines its behaviour in different media as well as its interactions with different chemicals. Adjusting the surface properties of cellulose is of great importance for its current and future applications, such as in papermaking and composites . Various research papers have shown the great variety of properties that can be obtained through modifying the cellulose surface. The modification of plant fibres may involve removing the surface impurities, swelling the crystalline region and removing the hydrophilic hydroxyl groups. Effectively reinforcing composites with plant fibres depends on the moisture content, fibre–matrix interfacial adhesion , and crystalline and cellulose content. The alkalization of plant fibres improves their performance as a composite reinforcement . Cellulose can also be chemically altered to increase its potential by making derivatives such as carboxymethyl cellulose, methyl cellulose, ethyl cellulose, hydroxypropyl cellulose and cyanoethyl cellulose . Carboxymethyl cellulose (CMC) stands out among the stated derivatives; it is manufactured in significant amounts due to its wide commercial applications with regard to volume demands. It is used in many different industries, including food ingredients, pharmaceuticals and materials . Such diverse applications along with its low pricing make CMC one of the major market shareholders within all the cellulose ether product categories . Recently, ionic liquids (ILs) that have hydrogen bond acceptors in their structure, such as Cl−, Br− or SCN−, have been used to dissolve and process cellulose with great success [10, 11, 12]. These hydrogen bond acceptors are thought to be responsible for interrupting the extensive intermolecular and intramolecular hydrogen bonding within cellulose [13, 14, 15]. Due to the structure of cellulose, it is regarded as an active chemical. Functional groups can be introduced into the cellulose molecules through the hydroxyl moieties. New groups break the hydrogen bonding network in the cellulose, decrease the crystallinity and increase its solubility [16, 17, 18, 19]. Ionic liquids have been used as a reaction medium for modifying cellulose using urea, phthalic anhydride (PA), maleic anhydride (MA) and butyl glycidyl ether (BGE). Previous experiments have shown that the hydrogen bonding interactions decrease and that anhydride groups have a higher reaction activity with hydroxyl groups . Cellulose-based materials are easily obtained and can be employed as relatively cheap absorbents. They may also be used to remove heavy metal ions prior to the appropriate chemical treatment. Chemically modified cellulose materials present higher absorption capacities than unmodified forms. Modifications can be carried out in two ways. Monomer-grafting enables attaching many different functional groups to the backbone of cellulose. Another method of attaching new specific groups to the cellulose is direct modification in which new groups are bonded to hydroxyl groups through chemistries such as base solutions, mineral and organic acid solutions, organic compounds or oxidizing agents [21, 22, 23]. Despite development of new modification techniques, well-known compounds like silane coupling agents and various anhydrides are commonly used chemical modifiers. Due to their structure, they are able to form chemical bridges between cellulose fibres and the matrix. In various experiments, it was suggested that chemical reactions between cellulose and a coupling agent led to improvements in the mechanical properties of the composites. In spite of the fact that they are being commonly employed in cellulose modification, convincing evidence was not provided . The Arbocel® UFC100 Ultrafine Cellulose for Paper and Board Coating was the type of cellulose used for modification. It is in a powder form, nonmodified and insoluble in water. Simultaneously, this cellulose exhibits a high water binding capacity (even at high temperatures and shearing forces). Its average fibre length is 8 μm. The first of the used modifiers was maleic anhydride (MA), otherwise known as 2,5-furanedione, provided by Sigma-Aldrich®. It is a white solid substance with a molecular mass of 98.06 g/mol and is commonly used in cellulose chemical modification. When dissolved in water, it turns into maleic acid. Its melting point is somewhere in the region of 51–56 °C (lit.) or 52–54 °C. Furthermore, the fibres were also treated with vinyltrimethoxysilane (VTMS) U-611 from UniSil®, which is a transparent, colourless liquid. In addition to being dissolvable in benzene, carbon tetrachloride and acetone environments also have the capability of reacting with water. All reagents were commercial products of the highest purity available, and their structural formulas are shown in Fig. 1. The cellulose was modified using vinyltrimethoxysilane (VTMS) and maleic anhydride (MA). In both cases, fibres were dried for 24 h at 70 °C, and then, the temperature was raised to 100 °C for an hour before performing the modification. As for the modification with maleic anhydride, the cellulose was treated in an acetone at room temperature for 2 h (oil bath 40 °C, 60 r/min) using an evaporator. After stirring, the acetone was removed with a vacuum distillation process (oil bath 60 °C, initial pressure 200 mbar). Then, the sample was heated in a vacuum oven at 100 °C and 170 mbar for 4 h . Figure 2 describes the maleinization process of the cellulose fibres with the creation of ester bonds on the surface of the filler. Modification with the use of VTMS, the ethanol (used as a solvent), cellulose and silane were stirred, with the use of a rotary evaporator, in a flask for 4 h at 60 r/min (oil bath, 40 °C). Then, the vacuum distillation (oil bath 60 °C, initial pressure 200 mbar) was performed. After removing the solvent, the samples were dried for 24 h in a vacuum oven (40 °C, 170 mbar) and then for 48 h in a dryer at 120 °C . Figure 3 presents the scheme of the silanization of the cellulose fibres with a focus on the successive stages of the chemical modification. Such prepared powders were stored in a dryer at 40 °C. In Table 1, the conditions taken into consideration during all stages of both modifications processes are provided. Fourier transform infrared spectroscopy (FTIR) absorbance spectra have been investigated within the 4000–400 cm−1 range which helped in assessing structural changes as each chemical group has its specific absorption band. The experiment has been performed with the use of Thermo Scientific Nicolet 6700 FTIR spectrometer (p/n 912A0637) equipped with diamond Smart Orbit ATR sampling accessory (p/n 840-145300). Thermogravimetric analysis (TGA) has been used in order to get acquainted with thermal degradation process detecting the mass loss as a function of raising temperature in the range from 0 to 600 °C. Mettler Toledo® TGA/DSC 1 STARe System equipped with Gas Controller GC10 has been employed in this investigation. On the basis of the gathered data thermal degradation steps, activation energies have been calculated with Broido  and Coats  methods in order to assess thermal stability of the prepared samples. Differential scanning calorimetry (DSC) investigation has been performed in a temperature range from − 50 to 300 °C prior to analyse enthalpy changes (ΔH) during thermal decomposition of cellulose. Here, as well, Mettler Toledo® TGA/DSC 1 STARe System equipped with Gas Controller GC10 has been employed. 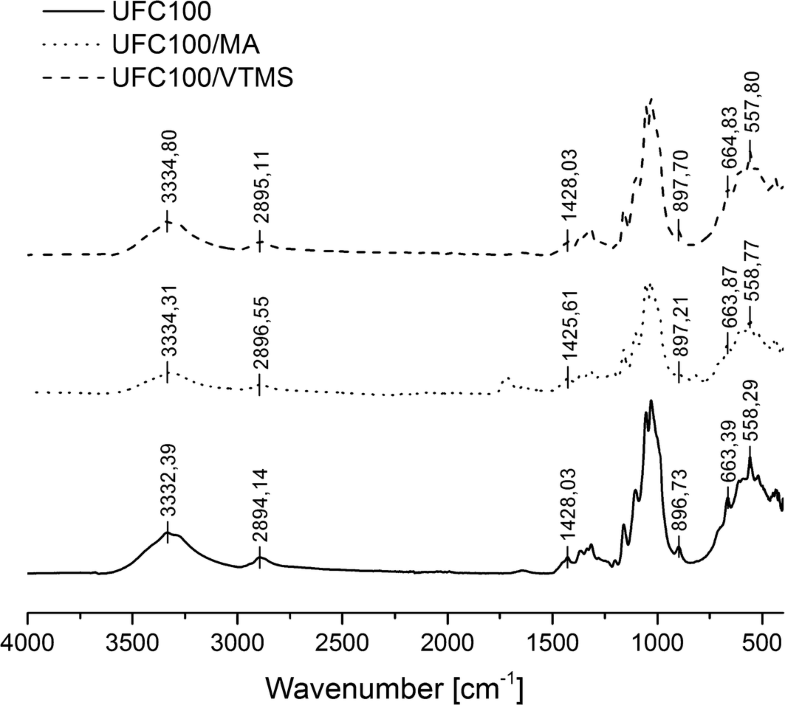 Measurements of the particle sizes of cellulose UFC100 were taken using aqueous dispersion of the samples (0.1 g of the powder per 200 ml of distilled water). These solutions were subjected to ultrasound for 30 min, and the dispersion samples were poured into colorimetric cuvettes . ZetaSizer Nano-S90 from Malvern Instruments has been employed. 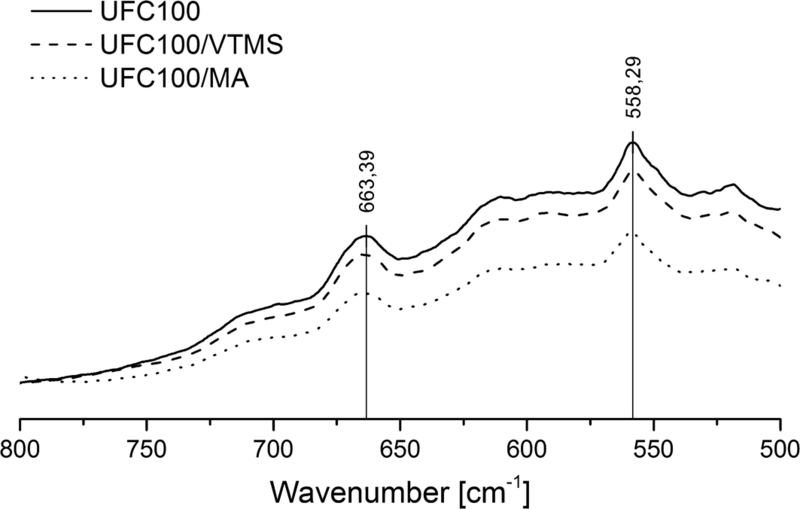 The vibrational spectra of the cellulose fibres exhibit observable band changes depending on the kind of modification conducted. Their analysis provides valuable information and helps to suggest the cellulose changes after maleic anhydride (MA) and vinyltrimethoxysilane (VTMS) grafting. Considering Figs. 2, 3 and the results from other scientific studies, visible changes were observed. 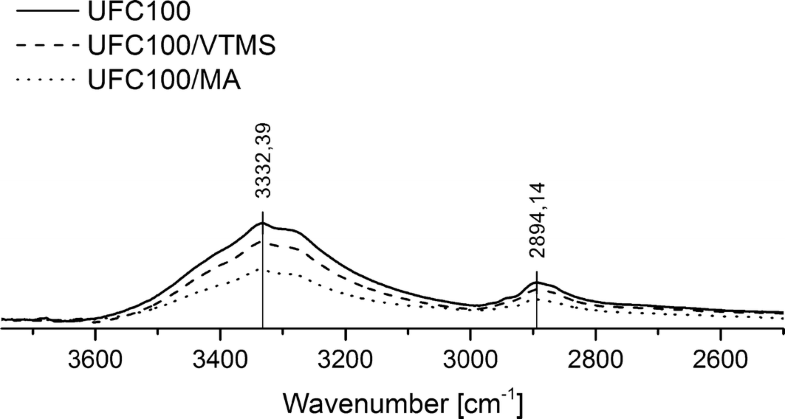 For the modification performed with the use of MA, the increased intensity of the absorption bands related to the C–O, C=O and C=C bonds was observed . In contrast, the cellulose treated with VTMS indicated signals of the chemical groups containing silicon atoms [31, 32] and C=C bonds. In addition, in both cases, a decrease in the intensity of the absorption band of the –OH moieties was observed as a result of the creation of ester and Si–O bonds. Visible absorption bands may also have their origin from unreacted reagents adsorbed on the cellulose fibres surface. Taking a closer look at Fig. 4, the absorption band at 3332 cm−1 was assigned to the O–H stretching vibrations that occurred due to both the water and O–H moiety content in the sample. The broadband in the 3600–3100 cm−1 region also provided considerable information concerning the presence of hydrogen bonds . Moving further, the absorption band at 2894 cm−1 was connected to the C–H stretching vibrations coming from the cellulose fibres. These two peaks have been observed in many other works [34, 35]. Each of the performed modifications contributed to the decrease in the intensity of those absorption bands, compared to the initial cellulosic samples, and, thus, also to the lower concentration of the O–H and C–H moieties in these two samples. As for the maleinization reaction of cellulose, some new signals were observed. The stretching vibration at 1719 cm−1 was assigned to the C=O bond , and the peak in the range of 1640–1618 cm−1 corresponds to the aldehydic and carboxyl stretching vibrations  or even to the adsorbed water, which was also identified in a few other studies . According to Fig. 5, the presence of those moieties confirms the occurrence of new functional groups on the cellulose fibres surface. Moreover, an increase in the intensity of the absorption in the range of 1300–1200 cm−1  and 900–800 cm−1 was observed, which was due to the increased concentration of the C–H, C=O and C–O–C bonds. Nevertheless, a decrease in the intensity in the range between 1150 and 1000 cm−1 was observed; the 1104 cm−1 band was attributed to the asymmetric in-phase ring vibrations, 1030 cm−1 was assigned to the C–O–C vibrations, and 1046–1043 cm−1 was attributed to the C–C, C–O–H, C–H and side group vibrations . The modification with the use of the silane coupling agent was not as easy to confirm as the maleinization reaction due to the overlapping effect of absorption bands. The absorption bands visible in Figs. 5 and 6, which correspond to the C–O and C–C stretching vibrations and CH2 rocking vibration at 1161–895 cm−1, also correspond to the Si–O–Si (1100 cm−1, 950–800 cm−1), Si–O–C (1450 cm−1), Si–OH (~900 cm−1) and C–Si–C bonds (663 cm−1) [39, 40]. The phenomenon of overlapping in the case of the silanization of the cellulose fibres was also observed in previous studies . However, a few shifts in the absorption bands to lower and higher wavenumbers were noted, in which comparison is shown in Fig. 7, e.g. –OH stretching vibration at 3332 cm−1, C–H stretching vibration at 3894 cm−1, C–O–C and side group vibrations at 897 cm−1, and C–OH out-of-plane bending at 558 cm−1. They could be caused by the interactions between the adsorbed and grafted silane and maleic anhydride functional groups, which are mainly polar, with infrared irradiation. The FTIR absorption band at 1428 cm−1, visible in Fig. 5, that was assigned to the symmetric CH2 bending vibration decreased. Its intensity, in comparison with the reference sample, reflects a possible reduction in the degree of the crystallinity of the sample modified with VTMS. This phenomenon was clearly described in detail in previous studies concerning the crystalline structures of cellulose fibres . DLS analysis is a technique that can provide valuable information in order to confirm the occurrence of a modification process. It provides data regarding the hydrodynamic radii, which have been carefully described in previous studies [42, 43]. Here, the particle size changes may indicate the effect of performed treatments. According to Table 2, it can be seen that the size of the particles changed depending on the employed modifier. The biggest particles were obtained with the use of maleic anhydride. However, in both cases, an increase in the hydrodynamic radius was observed, which proves that grafting occurred on the surface of the cellulose fibres (Fig. 8). However, the creation of clusters and chain entanglements is possible. The influence of the concentration on these phenomena has been widely described . Despite the fact that the exact radii values of the cellulose fibres might have been not known due to the aggregation processes, the results of the DLS investigation provided more details about their affinity to one another concerning the chemical groups on their surface and the surface free energy of the cellulose. The bigger are observed particles, the better affinity and possible treatment effect on particle interactions. A thermogravimetric investigation was conducted in order to define the changes in the thermal decomposition of the cellulose fibres. Many studies have been conducted on this topic [45, 46]. Considering Fig. 9, the first mass loss of each material was attributed to the release of water and volatile matter [47, 48] up to 150 °C. The decreases in the mass values at this stage for neat UFC100, UFC100/VTMS and UFC100/MA were 3.46%, 3.24% and 2.13%, respectively. The second decomposition event occurred at various temperatures with the initial point originated from 150 to 250 °C, depending on the type of modified material. This stage was assigned to the thermal degradation of the cellulose fibres . As shown in Fig. 9, the mass loss is lower in the case of the cellulose modified with MA (87.76%) and VTMS (87.94%), while for the neat cellulose fibres, this value is higher and equal to 92.57%. In Table 3, the data regarding the effects of modifying the cellulose with the silane VTMS and MA, representing the thermal stability of the materials, are shown. According to the first modifier, the thermal degradation of cellulose was prolonged but not as well as in the case of the modification with maleic anhydride. The use of MA resulted in an earlier onset of more intensive degradation and prolonged the whole process, which was determined from the tabularized temperature values. 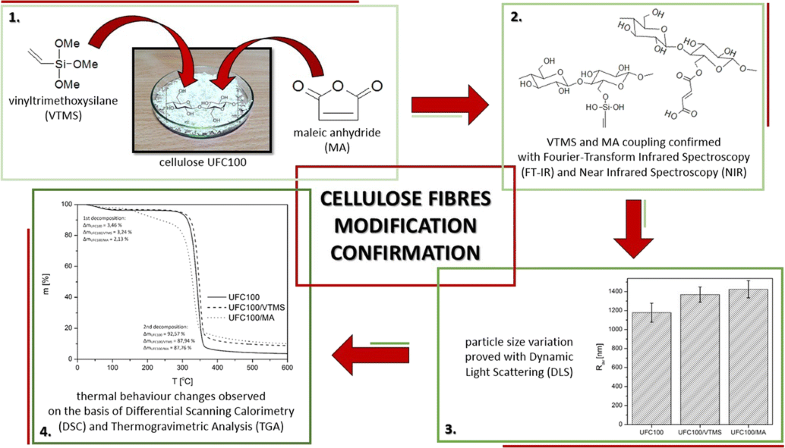 The thermogravimetric analysis evidenced that the weight loss of the chemically modified cellulose fibres was lower than that of the unmodified sample, similar to other studies . 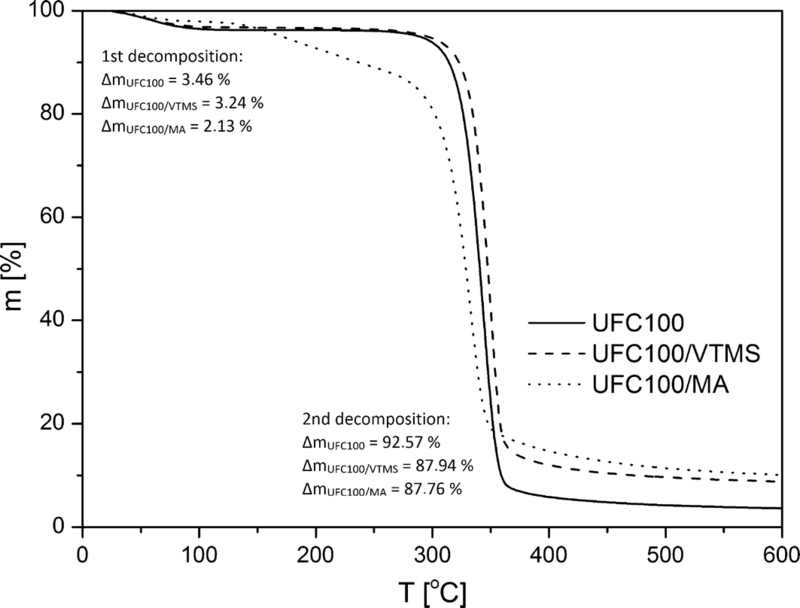 Moreover, the thermogravimetric curve of the neat UFC100 sample exhibited congruous parameters to the microcrystalline cellulose (MCC) thermogravimetric curve described by other scientists . Activation energies of thermal decomposition steps have been established with Broido  and Coats  methods as it has been shown in various researches [52, 53, 54]. Obtained values are in well correspondence and are confirmed in the literature . According to the results presented in Table 4, it may be concluded that the lowest value of first thermal decomposition activation energy is observed in case of the sample treated with maleic anhydride which confirms previously observed significant decrease in T5%. UFC100/MA occurs to be the specimen of poor thermal stability. On the other hand, modification with VTMS contributes to an increase of 1st step Ea in comparison with the reference sample. Consequently, UFC100/VTMS thermal resistance has been improved. Similar trends are observed considering 2nd decomposition step. Thermograms reveal some details about the water evaporation from the cellulose surface and fibres initial thermal decomposition . The DSC analysis revealed that even at 100 °C, completely dried cellulose was not obtained. These data show how troublesome it is to achieve the full desorption of water from the surface of hydrophilic fillers. This problem was also mentioned in other studies [57, 58] that evaluated the effect of water content on the glass transition temperature. According to Fig. 10, the Tg of all samples is near the region of − 40 °C, which, according to another study , indicates that the water content in the specimens, surprisingly, could be even approximately 17%. Nevertheless, no significant changes between the specimens, considering Tg, have been noted. The endothermic peaks at about 80 °C were strengthened as a consequence of the evaporation of water and the inner volatile substances. The shifts in the peaks to lower temperatures of the modified samples in comparison with the reference samples should be emphasized—from 81.35 °C (UFC100 ref.) to 76.70 °C (UFC100/VTMS) and 68.45 °C (UFC100/MA). Furthermore, the changes in the enthalpy also varied. The highest value was observed in the case of the neat cellulose fibres. A similar effect was observed in another study and was described as a result of the increase in the length-to-diameter ratio during the performed modification. Therefore, according to the authors, the evaporation of moisture was facilitated  which contributed to the fall in enthalpy values. In conjunction with Fig. 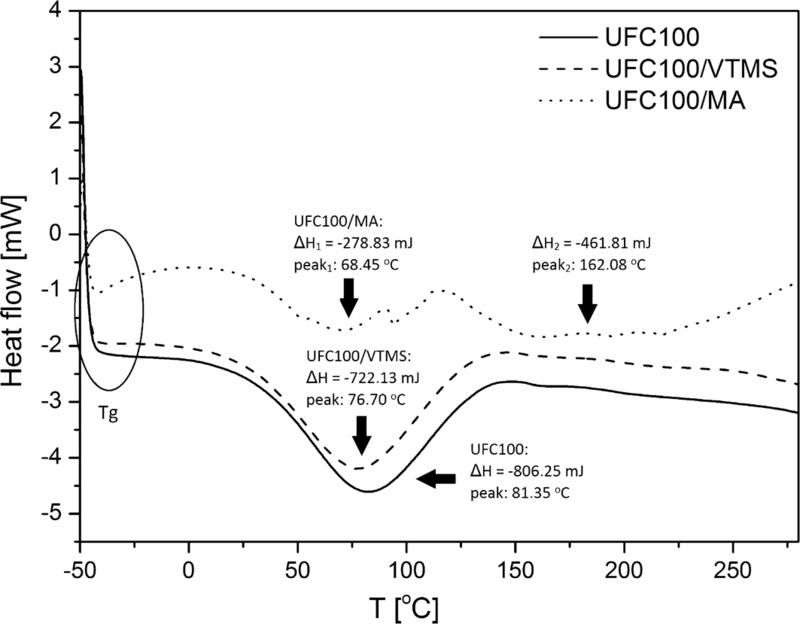 10, thermal degradation prolongation, in case of cellulose treated with maleic anhydride, a second endothermic peak, of a higher enthalpy value, can be observed at 162.08 °C. This may be connected with more complex thermal degradation of MA. 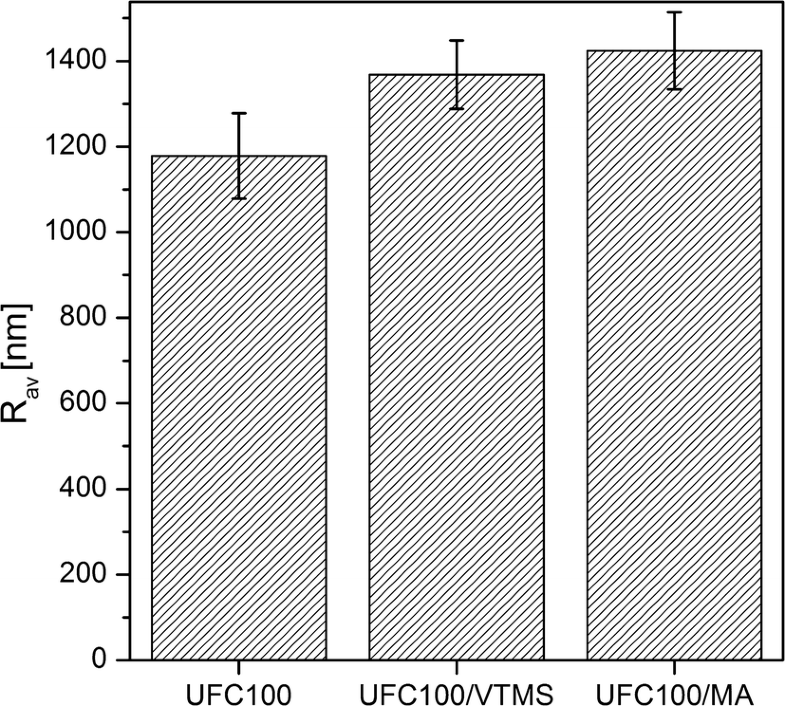 Inasmuch as the earlier decomposition of the fibre is visible in the DSC curve, the data provide a perfect confirmation of phenomenon observed in TGA—poor thermal stability of UFC100/MA in comparison with UFC100/VTMS. The samples have been characterized primarily from IR data. The FTIR spectra revealed that the chemical modification of the cellulose was successful. The absorption bands at 1719 cm−1 (C=O stretching vibrations) and 1638 cm−1 (aldehydic and carboxyl stretching vibrations) originated from the maleic anhydride grafted on the surface of the fibres. In the case of the silanization reaction, the shifts in the wavenumbers and the intensity decrease at 1428 cm−1 were crucial. 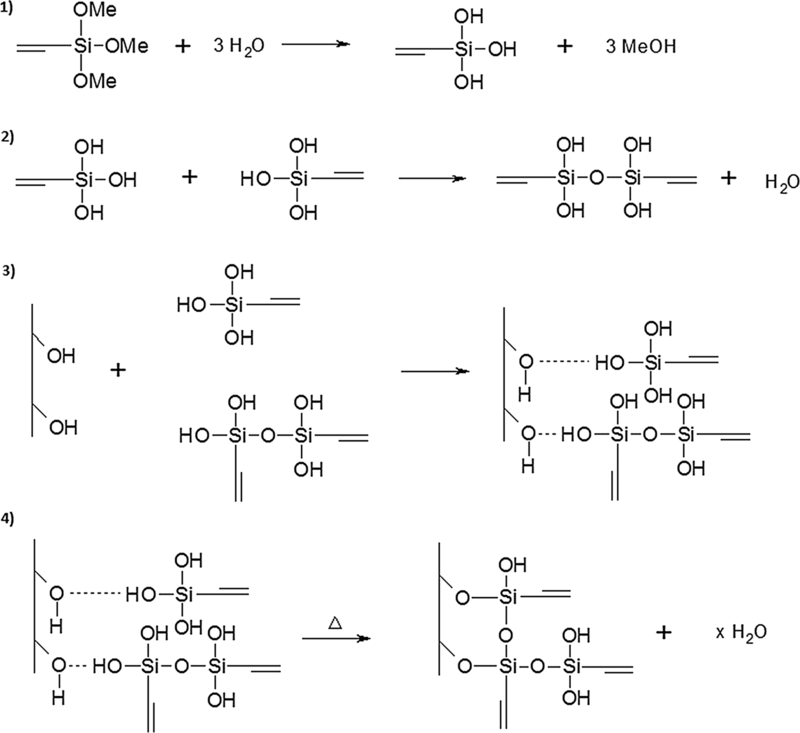 They indicated, not only, different interactions between the functional groups of the cellulose with the adsorbed and grafted silane but also information regarding the decrease in the degree of crystallinity. 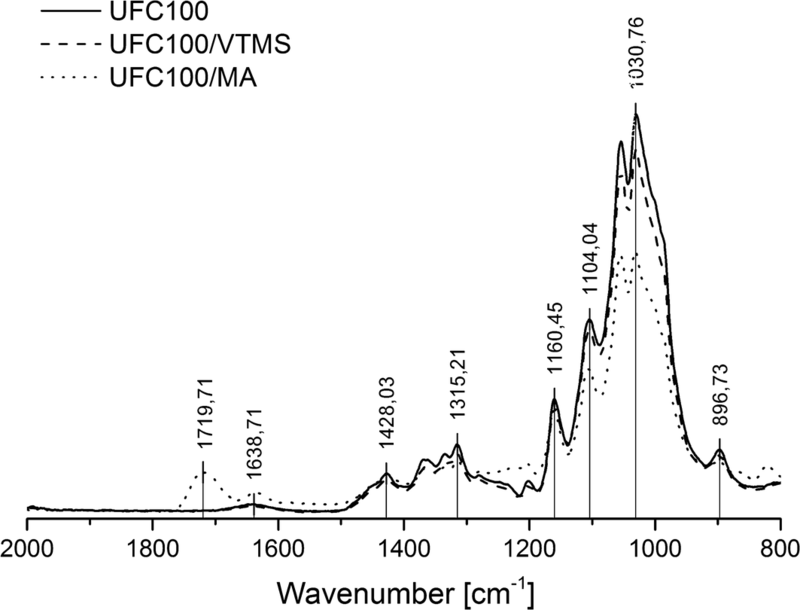 Nevertheless, possible signals from unreacted modifiers observed in FTIR spectra have to be considered. The DLS investigation proved that the modified fillers had a bigger size in comparison with unmodified sample, and the thermogravimetric analysis evidenced that the weight loss of the chemically modified cellulose fibres was lower. Moreover, the various onset times of the chemical decomposition of the inner specimens were noted and confirmed with both TGA and DSC investigations. The best improvement in thermal resistance, according to activation energy calculations, has been detected in case of VTMS treated cellulose fibres. All things gathered, performed modifications have affected cellulose structure as well as its thermal properties. Prepared filler may be added to the polymer matrix in order to create various green composites finding application, e.g. in packaging or automotive industry, which is of a high importance considering its higher biodegradation potential. Moreover, given fibres treatment result analysis, universal approach allows to describe chemical modification impact at many levels.